The Oklahoman Editorial Watch: Mark Green Didn't Say What??? I've been meaning to point this piece out, it is another very fine example of how disgracefully one-sided this alleged newspaper is, and on a ridiculously consistent basis. “I don’t know anything about cars.” Uh, not exactly what you want to hear f rom the guy who’s going to lead General Motors when it emerges from bankruptcy protection later this summer. Former AT&T chief Edward E. Whitacre Jr. admits he’s not a car guy, but the man known as “Big Ed” figures business is business, and he was pretty good at it over a 43-year career. The White House is confident Whitacre will do fine, noting that Ford’s current CEO, Alan Mulally, came from Boeing. Still, taxpayers jumpy over the public investment in GM — $20 billion already and another $30 billion to come — must hope Whitacre studies up a bit before he officially takes over. GM can’t afford any more missteps. I do not have a big problem with Green pointing these things out. I just wish he would point these things out when people his paper support do the same kind of things. A bachelor's degree in industrial engineering and record in shaping a "monolithic" AT&T into a diversified enterprise make Whitacre "a good choice," said Jim Hall, principal of 2953 Analytics auto-consulting firm in Birmingham, Michigan. "He was one of the guys who helped create a new AT&T that wasn't so dependent on land-line phone service," said Hall, a former GM engineer. "There's a parallel with General Motors. GM is not now about just making cars. It's about re-creating itself as a 21st-century car company. They have to have somebody at the top that understands they have to make a new GM." Now let me point out someone Green and the entire Oklahoman Editorial Staff completley ignored during the Bush years. And this is one of countless examples. 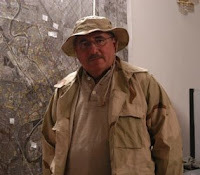 John Agresto also saw a silver lining as he watched the looting of Baghdad on TV. He envisioned his job - "a never-to-be-repeated adventure" - as the remaking of Iraq's system of higher education from scratch. In that context, the stripping of the universities and the education ministry was, he explained, "the opportunity for a clean start," a chance to give Iraq's schools "the best modern equipment". If the mission was "nation creating," as so many clearly believed it to be, then everything that remained of the old country was only going to get in the way. Agresto was the former president of St John's College in New Mexico, which specialises in a Great Books curriculum [which emphasises an education based on broad reading]. He explained that although he knew nothing of Iraq, he had refrained from reading books about the country before making the trip so that he would arrive "with as open a mind as I could have". Like Iraq's colleges, Agresto would be a blank slate. If Agresto had read a book or two, he might have thought twice about the need to erase everything and start all over again. He could have learned, for instance, that before the sanctions strangled the country, Iraq had the best education system in the region, with the highest literacy rates in the Arab world - in 1985, 89% of Iraqis were literate. By contrast, in Agresto's home state of New Mexico, 46% of the population is functionally illiterate, and 20% are unable do "basic math[s] to determine the total on a sales receipt". Yet Agresto was so convinced of the superiority of American systems that he seemed unable to entertain the possibility that Iraqis might want to salvage and protect their own culture and that they might feel its destruction as a wrenching loss. *(footnote) When agresto failed miserably at his job of rebuilding Iraq's university system, leaving the country with the job undone, he revised his early enthusiasm for looting, describing himself as "a neoconservative who's been mugged by reality." It was not until September 18, 2007 that The Oklahoman even mentioned Agresto's name. Three years and three months after he left Iraq. They did so by giving a blurb from this column by Thomas Sowell. Oh yah, if you get bored..look up a guy named Gary Heldreth!